Despite being gone down one goal in the early minutes of the first half, East Bengal found their foot in the second half and scored a marvelous goal. As Robin Singh scored the winning goal of the match, East Bengal kept their title hopes alive after beating the defending Champions Bengaluru FC in their fourth I-League fixture of this season. Signing out from Kolkata, see you in the next match. Good night. 90'+3' The referee whistles to indicate the conclusion of the match. Final score, East Bengal 2-1 Bengaluru FC. 90'+2' Norales with a solo run but is intercepted by Bukenya in the final half. The Ugandan defender seems to be on fire tonight. 90' 3 minutes extra time awarded by the referee. 89' Wedson with a superb chip from 25 yards out but is saved by the opposition goalkeeper Amrinder Singh. 88' Bengaluru being ultra aggressive in the dying minutes of the match. Norales tries a volley inside the East Bengal box but could not reach the ball in the air. 85' Substitution for East Bengal: Mehtab OUT, Borges IN. 84' Mehtab is injured and is being brought out of the pitch. 80' Free kick for East Bengal. Narayan Das takes the shot but is misjudged. The shot goes wide. 78' GOOOAAAL! Robin Singh with the third goal of the evening! East Bengal leads the game with two goals to one. 77' Substituition for Bengaluru: Lyngdoh OFF, George ON. 74' Robin Singh hits the woodwork! Amazing left footed shot by Singh but the shot is deflected by the bars! Phenomenal! 71' Wedson goes down trying to find a gap between Juanan and Johnson. Superb dribbling by the Haitian forward. 69' The crowd seems to be really into Bukenya as the Ugandan defender's names are being chanted here in the stadium. Talk about popularity! 67' East Bengal seems to be finally getting the hold of the game as the Red and Gold players goes out on a all-out attack once again. Bengaluru defense in shaking with only John Johnson as the silver lining in their back four. 63' Plaza with a solo run down the left wing but is brought down by the away goalkeeper Amrinder Singh. Conrer for East Bengal. 60' Robin Singh is brought down by Juanan. East Bengal is awarded a free kick from 25 yards out. 56' Narayan Das receives an impressive through pass from Mehtab and goes into an one-on-one position with Bengaluru goalkeeper Amrinder Singh. Singh comes out and slides the ball away from the goal. Wasted. 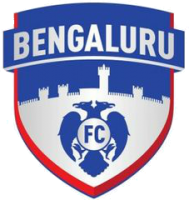 54' Goal kick for Bengaluru FC. Amrinder Singh takes the shot but the shot deflects from Watson's feet and goes out. Throw in for East Bengal. 52' Bengaluru defenders with a higher presence in the pitch. The away team seems to be desperate for the winning goal. 51' Bengaluru is again up with a quick counter but the East Bengal defenders intercepts the ball and sends it outside. Corner for Bengaluru. 48' Free kick for Bengaluru. Ralte takes the shot but quick response by Rehenesh as the East Bengal keeper fists the ball back into the play. 46' Substitution for East Bengal: Amirov OUT, Robin Singh IN. 46' We are back with the second half between East Bengal and Bengaluru FC. Both the home and the away team had started the game brilliantly. However, nice touches did not last very long as the match went down to confrontations between the teams. East Bengal looked a tad bit in problem after the Red and Gold brigade conceded the first goal of the evening but soon got back up their feet with a goal from defender Ivan Bukenya. Back in a few minutes gents, stay tuned. 45'+2' The referee whistles to indicate the ending to the first half of the match. 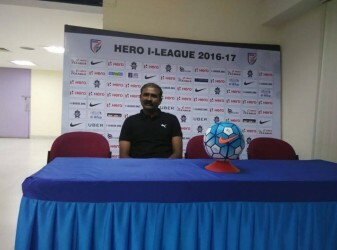 East Bengal 1-1 Bengaluru. Stay tuned, back in a few minutes. 45' 2 minutes Extra time added. 44' Nikhil Poojary displaying a phenomenal attacking display. The u-22 player is showing glimpses of his true potential as he went down threatening Amrinder Singha again. 43' Vineeth looks like he has a reputation to save. The Kunnur born forward with another impressive run down the left wing and crosses but is misplaced as the ball goes out. Goal kick for East Bengal. 41' Vineeth receives another diagonal in the East Bengal box from the midfield but decides to pass the ball sideways again. Wasted. 38' Plaza goes out on an amazing solo run. Dribbles John Johnson and shoots the ball in the Bengaluru goalposts but the shot is saved by Amrinder Singh. What a nerve! 37' Wedson tries to go out on a solo run but is intercepted by the Bengaluru defenders and passes the ball backward. The crowd seems angry with the move from the Haitian. 35' The game has gone from a tactical masterclass to a physical confrontation between both the teams. Ugly play by both the teams here in Barasat Stadium. 34' Lalrindika Ralte is brought down after a hideous tackle by Johnson. Ralte has received a yellow card. 32' The game has heated up a degree now. Cheetri is once again confronted by the East Bengal players as the skipper put in a rash challenge on East Bengal's Mehtab. 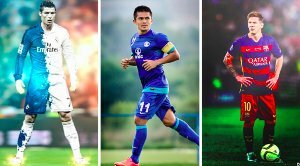 30' Yellow card for Bengaluru skipper Sunil Chhetri and East Bengal midfielder Mehtab Hossain as both the players got into a mid-pitch heated conversation between themselves!
! East Bengal 1-1 Bengaluru. 25' The stadium has now gone silent since Bengaluru's goal. The fans could not believe it! The atmosphere just took a U-turn here in Barasat stadium. 22' GOOOOOAAAAAL!!!!! CK Vineeth scores the first goal of the evening from a cutting edge pass from Lyngdoh!!!! 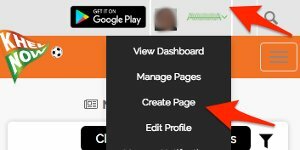 East Bengal 0-1 Bengaluru! What a finish! What a player! 20' Sunil Chhetri shoots inside East Bengal's box but the skipper is again misjudged as the ball goes wide over the bars. Goal kick for East Bengal. 19' Plaza gets a long ball from down the left wing but could not net the ball. Easy save for Amrinder Singh here. 16' It has been a lazy first quarter for Bengaluru goalkeeper Amrinder Singh apart from few long shots from East Bengal. The visitors are displaying nothing less than a total unit game here. 15' Solid chance wasted by CK Vineeth. 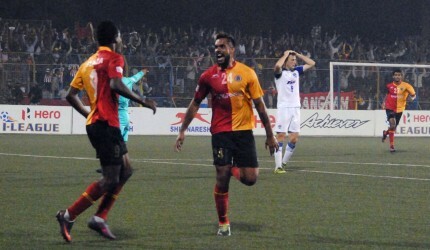 The striker could not move into position as the long ball came in from Lyngdoh. Wasted once again. 12' Lenny Rodrigues shoots from the half line but the shot is misplaced. The ball goes wide over the bars. Wasted. 11' Bengaluru's Ralte with an impressive run down the left wing but Gurwinder Singh clears the threat with a sliding run. Nice attacking display from Bengaluru. 8' Bengaluru with an aggressive approach to the game. Udanta Singh goes with a solo run but is brought down by East Bengal's Bukenya. 6' Mehtab with a rash challenge on Johnson. Johnson goes down but the referee chooses to let the game continue. The advantage is for the home team. 4' Throw in for Bengaluru but Narayan Das was quick enough to retaliate and as a result, the ball goes out again. Corner for Bengaluru. 3' Huge numbers of supporters have come to the stadium. The atmosphere is amazing and lively. Red and Gold smokes in the air. 1' We have kickoff here in Kolkata. 04:35 pm The teams are out. Here are benches quickly. 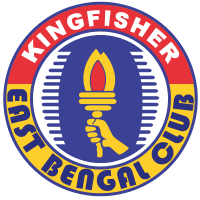 East Bengal: Subhasish (GK), Gurung, Jackichand, Borges, Haokip, Mehtab Singh (U-22), Robin Singh. 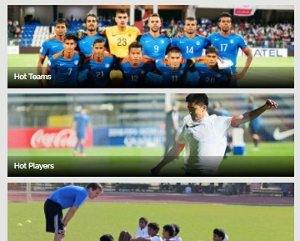 Bengaluru FC: Norales, George, Nishu, Daniel, Bhattacharya (GK), Malsawmzuala (U-22), Dessai. 04:30pm We are less than 10 minutes away from kickoff. Stay tuned. 04:15pm The head-to-head between these two teams is tight. In seven previous mettings EB hold slight edge with four wins to Bengaluru's three. 04:10pm Both these teams have have had fine starts to the season. 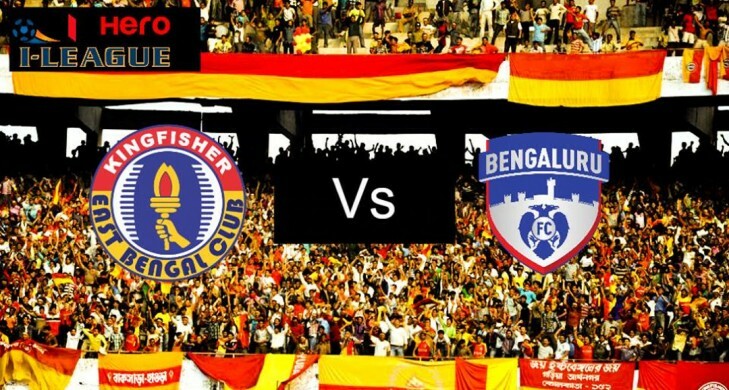 East Bengal are undefeated in three games, while Bengaluru have a perfect record. 04:00pm Hello and welcome to the I-League game between East Bengal and Bengaluru FC. This is your host Sourav Neogi live from Barasat Stadium.